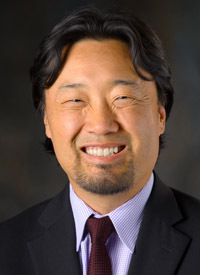 David S. Hong, MD, specializes in the earlyphase development of anticancer drugs, with a focus on the molecular basis of cancer. His field of research includes studies of tropomyosin receptor kinase (TRK) inhibitors, which target gene fusions that occur in multiple tumor types. Several TRK inhibitors are being developed as tumor-agnostic, pan-cancer drugs. Hong is a practicing medical oncologist at The University of Texas MD Anderson Cancer Center in Houston, where he is an associate professor and deputy chair of the Department of Investigational Cancer Therapeutics. He discussed the TRK pathway and potential new molecularly targeted therapies in an interview with OncologyLive®. What is the role of the TRK pathway? These neurotrophin family receptors are really identified as neural receptors: TRK A is involved in thermoregulation, TRK B in movement, memory, body weight and appetite, and TRK C in proprioception. It was subsequently found that there were cancer cells that displayed these unique fusion genes involving the NTRK genes fused to a partner promoter of some type that seems to drive through the MAPK [mitogen-activated protein kinase] pathway. The cancer cells seemed to be oncogenically addicted to the TRK pathway. I think initially there was some interest in targeting these receptors for the management of pain but when they found these fusions, they thought that maybe it was worth trying this in cancer. How is the TRK pathway being targeted for cancer treatment? Larotrectinib [LOXO-101] epitomizes this drug class. It’s a small-molecule inhibitor that specifically targets these TRK fusion proteins. The other molecule in development is entrectinib [RXDX-101], which is the most specific inhibitor of TRK. There’s some suggestion that drugs like crizotinib [Xalkori] have some inhibitory effects on TRK and there are some other molecules in development. I think cabozantinib [Cabometyx/Cometriq] also has some TRK inhibitory activity. But these are very “dirty” [nonselective] kinases. If you look at the kinome, where TRK is, it’s kind of the same region as where ALK and ROS are, which both crizotinib and entrectinib target. So, some of the more “dirty” kinases probably would target TRK as well but I’m not entirely sure they would have the same effect as larotrectinib or entrectinib, which have IC50s [half maximal inhibitory concentrations] that are very specific and potent for these TRK proteins. In what kinds of cancer types do TRK inhibitors have the greatest potential? David Hyman, MD, of Memorial Sloan Kettering Cancer Center gave a fantastic presentation at the 2017 American Society of Clinical Oncology [ASCO] Annual Meeting about larotrectinib, which suggested that the effects of these drugs are independent of histology. That is what is unique about this drug. Anybody who has these TRK fusions, independent of the partner gene and of the specific NTRK gene involved, responds to larotrectinib profoundly, and experiences profound tumor shrinkage. It turns out that in the broader more common cancers, such as colon, sarcoma, lung, and probably thyroid cancer, the presence of these TRK fusions is probably rare, likely less than 1%. But there seem to be some tumor subsets that are very specific, almost pathognomonic, for TRK fusions, such as salivary or mammary analogue secretory carcinoma [MASC] tumors, secretory breast cancer, infantile fibrosarcoma, and general nephromas. I’ve probably enrolled the most patients with salivary and MASC tumors in phase I studies and some in phase II, and I have not yet seen one that does not have a TRK fusion. But we’re not entirely sure at this point what the true prevalence is, because these TRK fusions are ultimately rare, and we’re still exploring that. I think with more broad-based next-generation sequencing and testing for TRK fusions, we’ll have a better sense of the real prevalence. According to the presentation that was given at ASCO, up to 5000 patients a year could have these TRK fusions. I suspect that there may be even more and the history of drug development would suggest that some of these rare tumors are not as rare we thought they were. I think it’s too early to say what the exact prevalence is across all diseases, but I believe it’s likely to be even higher than we anticipate. What are the most significant unanswered questions or challenges? The rarity of this fusion in general is a major issue and I think ultimately the challenge will be testing patients. Although next-generation sequencing and testing are becoming more widespread, it’s not as though every single patient with cancer gets testing—in fact, it’s probably relatively rare. Testing happens commonly in places like MD Anderson and Memorial Sloan Kettering, because we have programs and protocols available to do this, but they are not things that are routinely done.